Are you in total fall mode yet? Have you broken out the tartan, knits and booties? I am slowly adjusting to the new season, testing out pairings of new (to me) colour combinations (like mustard and navy). 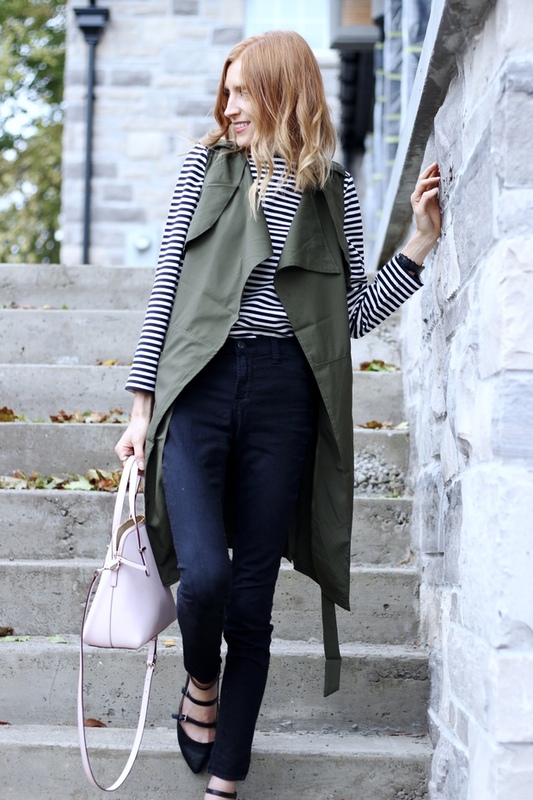 If you are looking for a new colour combination to try out this fall, it's olive and blush. I laugh writing that because olives and the colour blush are two of my favourite things-- seriously, I used to eat bowls of olives growing up! (weirdo... I know) In all seriousness, I wish more of these photos turned out because it was such a perfect, fall-esque day. The air was chilly, the apple tree was both sheltering me from the minuscule drops of rain coming out from the overcast, dreary sky, and apples were dropping off the tree's limbs by the minute. But I feel like we all have those days when you just don't feel great but push through it and force a smile. This apple tree is now gone and so are those "not-so-great" feelings I was experiencing that day. What I'm left with is the reminder that every day brings with it new sentiments and new ideas. Just like the idea to pair olive and blush together. A striped top adds to the androgynous tone of the outfit, but the pop of colours emitting from the bag and pink lip offer up and ounce of femininity to the outfit. These flats have become go-to for fall. I've been getting compliments on them left, right and centre and all are shocked to discover their source. It's Target! They bridge the gap between comfort and chic and pair well with everything from dresses to jeans. 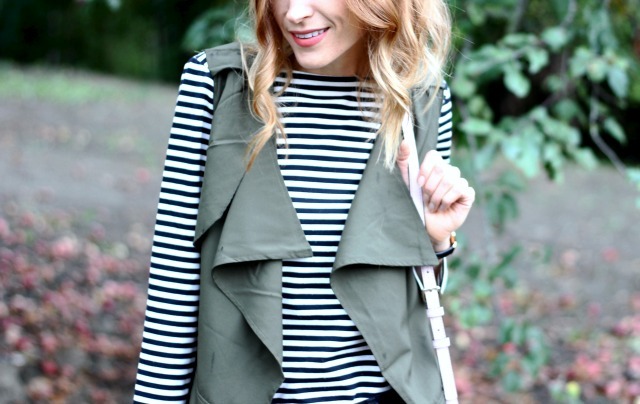 The vest is another key piece for fall. Perfect for layering over short sleeves, long sleeves and light sweaters and they offer up just the right amount of warmth for a cool day! Any different styles or colours your revelling in for fall? Fill me in! I love this look. Also I can see why you are getting tons of compliments on the flats. They are adorable! Carrie Bradshaw would be so jelly. Love the olive and blush! And how perfect with your black and white stripes. It all works so well together.